It’s not unusual to hear of celebrities visiting our little island and several notable people own houses (mansions) on the island, including Tommy Hilfiger, the Kerry’s, Eric Schmidt, Jerry Stiller and Anne Meara, and Dorothy Hamill, among others. 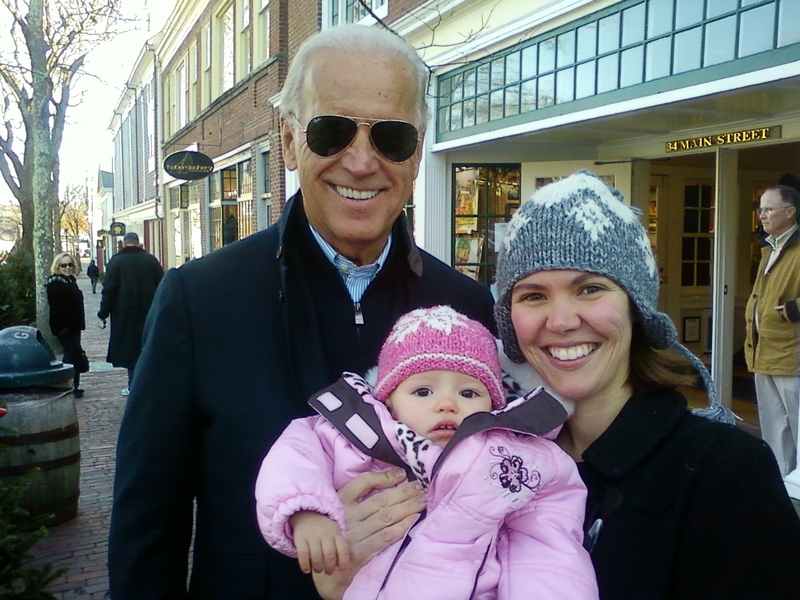 I mentioned in an earlier post that Vice President Biden and his family were here for Thanksgiving. Well, Sunday, Nora and I were walking in town with friends and we bumped into him. And he was kind enough to take a picture with us! Normally I wouldn’t approach a famous person for a photograph, but I really respect our president and vice president and thought it would be a great picture for Nora. I have to admit, I was super nervous and much less smooth than I could have been. I shook his hand, but he had to prompt me for my name. If I’d been less tongue-tied, I would have thanked him for all his hard work. He told me that he’s been coming to the island for Thanksgiving for 35 years and it’s his Thanksgiving tradition, though, so I suppose there’s always next year. Wow! He goes to Nantucket every year? Interesting. Well, now you have plenty of time to figure out what you’ll say to him NEXT time you bump into him! I wouldn’t have known him if i’d seen him….. boo on me for not keeping up.